Gamesys has announced the launch of its adventure game Here Be Monsters on iPad devices. The game is aimed at lovers of console games including Animal Crossing and Pokemon, as well as social titles like FarmVille, as it challenges players to collect famous mythological monsters from around the world. Players join a Ministry of Monsters, and will rise through the ranks as they build traps and craft bait items to capture these creatures. The game includes over 100 monsters to catch, including the Loch Ness Monster from Scotland and “Drop Bears” from Australia. The game’s “British sense of humor” sees gamers traveling to Stonehenge and other real-world locations, while interacting with make-believe characters. Before all is said and done, gamers will find themselves face-to-face with mermaid princesses, gnomes, yetis and more. 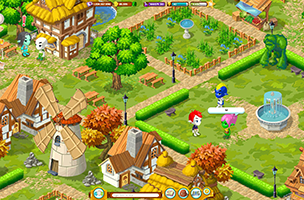 Bringing in elements from FarmVille and other social titles, Here Be Monsters gives players a Homestead and allows them to grow and collect resources including fruits, flowers, butterflies and fish. Players can also use the Homestead as a trophy case of sorts, showing off the spoils of their many adventures. Here Be Monsters was previously released on Facebook, and features cross-platform play, as well as an ample supply of existing quests for new users. Specifically, gamers can complete over 600 quests, with new content being released every two weeks. Here Be Monsters is available to download for free on iPad. Check back soon to follow the game on AppData, our tracking platform for mobile and social apps and developers.